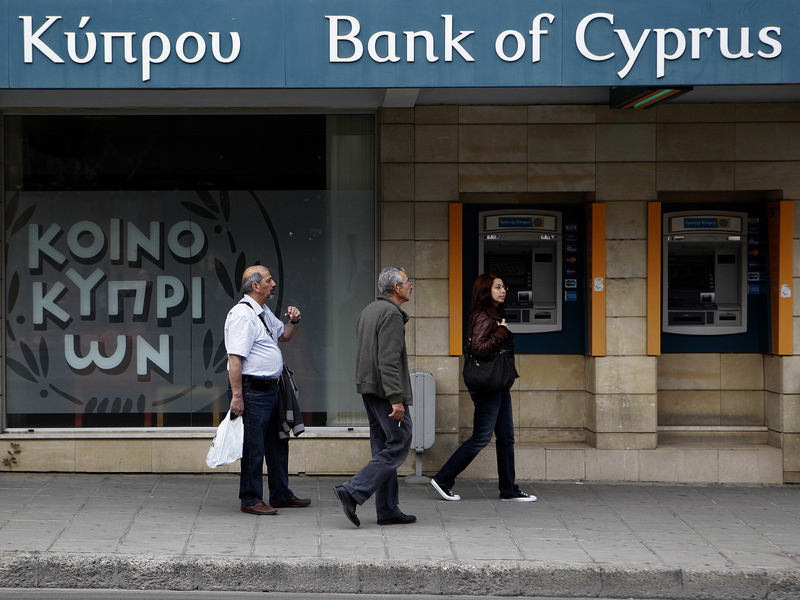 NICOSIA, Cyprus Big depositors at Cyprus' largest bank may be forced to accept losses of up to 60 percent, far more than initially estimated under the European rescue package to save the country from bankruptcy, officials said Saturday. The remaining 40 percent of big deposits at the Bank of Cyprus will be "temporarily frozen for liquidity reasons," but continue to accrue existing levels of interest plus another 10 percent, the central bank said. The savings converted to bank shares would theoretically allow depositors to eventually recover their losses. But the shares now hold little value and it's uncertain when  if ever  the shares will regain a value equal to the depositors' losses. Sofronis Clerides, an economics professor at the University of Cyprus, said: "Most of the damage will be done to businesses which had their money in the bank" to pay suppliers and employees. "There's quite a difference between a 30 percent loss and a 60 percent loss." With businesses shrinking, Cyprus could be dragged down into an even deeper recession, he said. Clerides accused some of the 17 European countries that use the euro of wanting to see the end of Cyprus as an international financial services center and to send the message that European taxpayers will no longer shoulder the burden of bailing out problem banks. Europe has demanded that big depositors in Cyprus' two largest banks  Bank of Cyprus and Laiki Bank  accept across-the-board losses in order to pay for the nation's 16 billion euro ($20.5 billion) bailout. All deposits of up to 100,000 are safe, meaning that a saver with 500,000 euros in the bank will only suffer losses on the remaining 400,000 euros. Cypriot officials had previously said that large savers at Laiki  which will be absorbed in to the Bank of Cyprus  could lose as much as 80 percent. But they had said large accounts at the Bank of Cyprus would lose only 30 to 40 percent. Asked about Saturday's announcement, University of Cyprus political scientist Antonis Ellinas predicted that unemployment, currently at 15 percent, will "probably go through the roof" over the next few years. "It means that (people) ... have to accept a major haircut to their way of life and their standard of living. The social impact is yet to be realized, but they will be enormous in terms of social unrest and radical social phenomenon," Ellinas said. There's also concern that large depositors  including many wealthy Russians  will take their money and run once capital restrictions that Cypriot authorities have imposed on bank transactions to prevent such a possibility are lifted in about a month. But fearing that savers would rush to pull their money out en masse once banks reopened, Cypriot authorities imposed a raft of restrictions, including daily withdrawal limits of 300 euros ($384) for individuals and 5,000 euros for businesses  the first so-called capital controls that any country has applied in the eurozone's 14-year history. The rush didn't materialize as Cypriots appeared to take the measures in stride, lining up patiently to do their business and defying dire predictions of scenes of pandemonium. Under the terms of the bailout deal, the country' second largest bank, Laiki  which sustained the most damaged from bad Greek debt and loans  is to be split up, with its nonperforming loans and toxic assets going into a "bad bank." The healthy side will be absorbed into the Bank of Cyprus. On Saturday, economist Stelios Platis called the rescue plan "completely mistaken" and criticized Cyprus' euro partners for insisting on foisting Laiki's troubles on the Bank of Cyprus.